The DLP® Digital Light Processing of Texas Instruments represents a proven technology of MEMS spatial light modulators also beyond standard front projection and DLP Cinema®. The general purpose DLP Discovery™4100 platform is different from the DLP standard projector hardware; it provides highest performance and flexibility within the DLP chipset family. The SuperSpeed V-Modules of ViALUX combine the USB 3.0 data transfer with the speed and steering capabilities of Discovery™4100 and represent the highest performance class of DLP catalog products available. ViALUX V-Modules offer unique flexibility in mirror control enabling a wide variety of new emerging applications. Outstanding pattern frequencies of 22 727 global array updates per second are achieved taking advantage of the 50 Gbit/s bandwidth of the Discovery™4100 chipset. The usable spectral range covers all wavelengths from 350 nm UVA to 2 500 nm NIR. 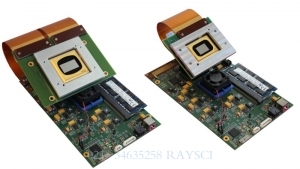 The Type A DMD package has efficient cooling options enabling up to 60 W sustained optical power illumination of the micromirror array. All V-Modules enable a rapid launch into application development with DLP technology. The ViALUX controller boards come with completely configured high-speed FPGA logic and USB 3.0 controller firmware so that customers save time and costs for a dedicated hardware and firmware development. V-Modules are well suited for education, academic research, proof of concept, and also as OEM components for series production. The high-performance Discovery™4100 chipset on the V-Modules is driven by the ALP-4.3 Controller Suite. The ViALUX proprietary FPGA design is the core of the well proven firmware and software interface. The USB 3.0 device driver supports all current Microsoft® Windows® operating systems and guarantees smooth integration with any type of PC. By addressing unique V-Module device numbers, multiple V-Modules can be controlled simultaneously from one application program. The USB 3.0 SuperSpeed transfer is the key for streaming data into the on-board RAM (8 or 16 GByte) further enhanced by lossless on-the-flight compression. The V-Module software API, a DLL library, fits seamlessly into standard programming platforms like C++, .NET, LabVIEW, MATLAB and is fully compatible to all former ALP-4 versions. Five V-Modules are available and two windows of the micromirror can be selected for use with visible or ultra-violet light. All SuperSpeed V-Modules are based upon the same main board and differ in the DMD extension board attached by one or two flexible cables, respectively.